I found this pair of Wedgwood Stanley Mills Plates in my basement. I live in Hamilton Ontario, Canada and I have just started trying to find out how old these are, and what they might be worth. The plates are in beautiful condition. Actually they look new. 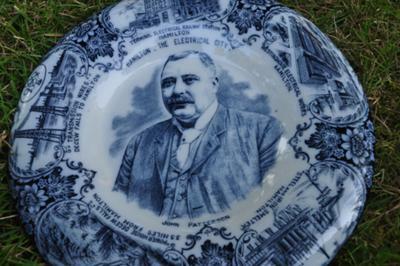 I did a little google searching for the guy on the plate (John Patterson) and apparently he is one of the founders of the Hamilton Electrical company in 1898. Ref: Hamilton The Electrical City John Patterson – 1890s. I believe the Stanley Mills plates were made around 1900-1915. Stanley Mills and his 2 brothers Robert and Edwin opened a general store on John St west side between Jackson and Hunter st. in 1888. They moved to a much larger location on King St e. 11 and 15 around 1903. This became Herbert S. Mills China in 1924. It is likely they were commissioned by the electric company and sold in the store. I have seen several of these Wedgwood plates at auctions and in antique stores over the years. It was coommon for individual stores or importers to have china companies like Wedgwood make special products for them. Herbert S Mills had Wedgwood make a UEL plate with a picture of statue that stands in front of the old court house on the corner of Main and John st.
A statue that was commisioned and paid for by Stanley Mills in 1924. Hope this info sheds some light.